A while ago I shared a friend’s recipe for paleo brownies on Instagram and they were so good I’m passing on the recipe to you here! The secret ingredient here is sweet potatoes – they give a bit of sweetness but are so packed with vitamins, minerals, and fiber that you can enjoy a brownie or two without feeling guilty! Sweet potatoes are a nutrient-dense carb choice to add to any meal. In these paleo brownies, the fiber in them helps keep blood sugar levels from going crazy, but also lets you enjoy a satisfying treat! Sweet potatoes also provide a huge amount of beta-carotene, which is helpful for everything from eye development to immunity. Beta-carotene turns into vitamin A in your body, both of which are helpful for eye development. It can even reduce your risk of eye issues later in life! Beta-carotene is also an antioxidant – it gets rids of free radicals in your body, which can cause damage to your cells. If left unchecked, free radicals can put you at risk of developing cancer and other conditions. Antioxidants, like beta-carotene in sweet potatoes and these paleo brownies, can help protect you against free radicals! Sweet potatoes also contain a good chunk of the vitamin C and manganese you need each day. Everybody knows vitamin C helps keep your immune system healthy. Not as many people know about manganese though. This little mineral helps with metabolism, bone development, wound healing and has antioxidant properties. 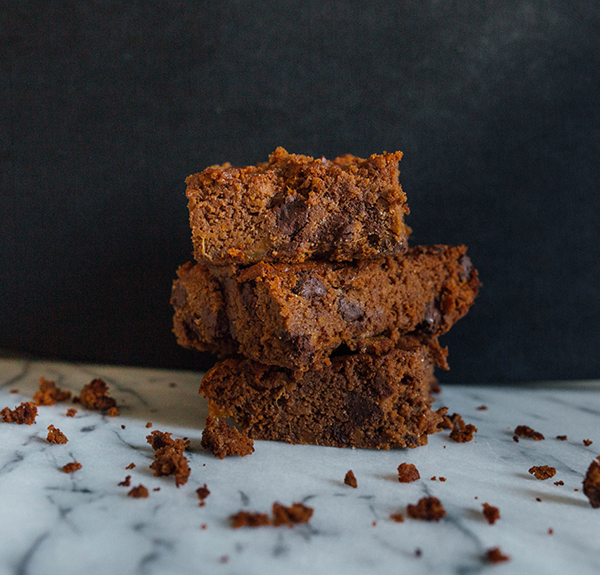 You don’t need much each day and you probably get enough from food, so don’t feel like you need to get a manganese supplement – just grab a paleo brownie or two! Once the sweet potato is soft, peel off the skin & mash it with a fork in a bowl. Turn your oven down to 350 degrees. Add eggs, coconut oil, honey and stir together. Add dry ingredients: coconut flour, cocoa powder, baking powder, cinnamon, salt and chocolate chips. Mix well. Pour into an 8x8 glass baking dish.